They like chocolate. They like cheesecake. 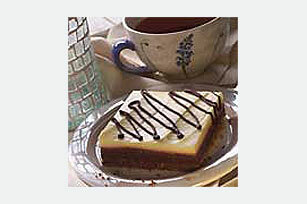 So they'll really, really like these easy to make chocolate-cheesecake squares! Line 13x9-inch pan with foil, with ends of foil extending over sides of pan. Empty Crust Mixes from both packages into large bowl. Add margarine; mix with fork until crumbs are well moistened. Press firmly onto bottom of prepared pan. Empty each Filling Mix into separate medium bowl. Prepare each filling with the milk as directed on package. Spread the chocolate filling evenly over the crust, then top with the cheesecake filling. Drizzle with melted chocolate. Refrigerate at least 1 hour or until ready to serve. Cut into 15 squares to serve. Store leftover dessert in refrigerator. To melt the chocolate, place chocolate in microwaveable bowl. Microwave on HIGH 1 minute, stirring after 30 seconds. (The chocolate will retain its shape.) Stir until chocolate is completely melted.